A couple of weeks ago I was at a family reunion and my very own uncle was surprised to hear that I still work full time and travel extensively for work. My husband and I own a retail travel agency and we each are elite travelers with American who traveled at least 75,000 miles in a calendar year. I am on the road a lot. He thought I all do was play with my bees, my chicken and my garden. I suppose that’s what my life looks like to him via social media. I immediately set him straight. Some of the other people at the reunion were asking how I work so much and still do what I do outside of work. Here are some tips to consider if you want to dabble in the various aspects of urban homesteading and maintain a very busy life. Regular watering is time consuming and really must be done regularly to avoid stressing plants and impacting your crops. This is also a fairly easy thing to automate which frees you up for other activities or to be gone altogether. 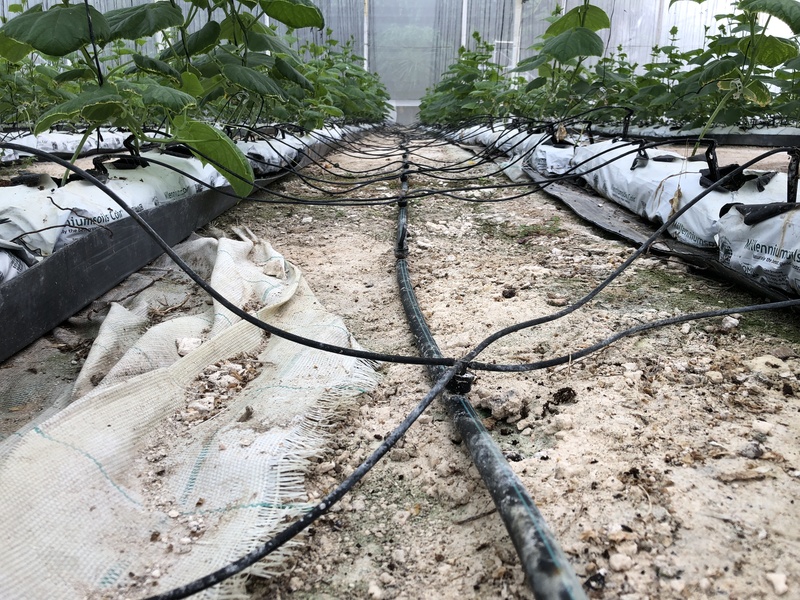 You can use drip hoses and timers, or you can install a fancy drip irrigation system. Either way, free yourself up from daily watering. Mulch is your friend that helps you three ways. 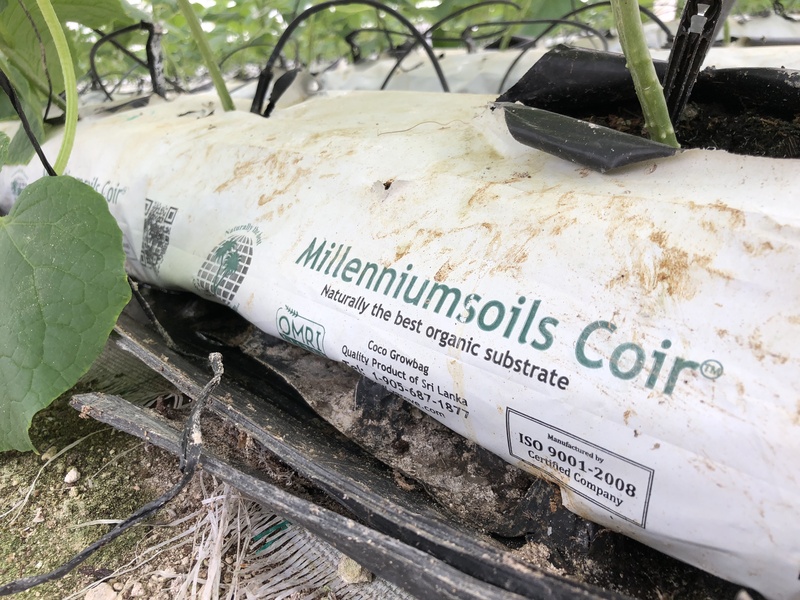 To start with, mulch helps supress weeds. This saves time weeding. Also, it preserves moisture which saves time watering. (Or, if you have automated your watering, it at least saves water.) Finally, as it breaks down on top of the soil it provides nutrition to the soil. One of my favorite mulches is grass clippings. Grass clippings are a fantastic mulch and, best of all, FREE! Let your standards go (a little). I always want my garden beds to be weed and grass free. I want my chicken coop not to smell. I want to be on top of everything. The fact is, though, during seasons when I am out of town a lot something has to give. For instance, I was out of town starting August 3rd till the 12th. I cleaned the coop the day before I left and today is August 14th and I haven’t been able to clean it since I got home because it’s been raining. It is messier than usual, but I think most chickens live in much less clean environments. I’m not suggesting neglecting them on a long term basis, but missing one cleaning probably won’t hurt anything. The same thing translates to other parts of your urban homestead. Your bees will probably survive if you don’t open up the hive every single week (although you may think YOU will die not checking on them!). Your garden will live (as long as your irrigation system is watering it) if you don’t pull the grass and weeds out for a week or so. So, allow yourself to relax and live other parts of your life when you need to. My spoiled hens really prefer when I bring them freshly chopped herbs and flower petals from my yard to mix with their dried mealworms and chicken feed. However, the fact is that they are chickens and can certainly eat plain chicken feed. To that end, I do have a large poultry feeder underneath the coop in the run (protected from rain). If they have to, the girls have several days of feed available to them. Also, I have a five gallon waterer and now that the weather is cooling off that is an option also. Likewise, I have several different sizes of syrup feeders for the bees. I’m not needing to use them at the moment since my bees got honeybound from me feeding them too much! You probably have friends and/or neighbors who want to garden / homestead like you do. Let them try it temporarily while you’re gone! I have a dear sweet friend who has been lovingly taking care of my hens when I’ve been gone. I have also established the daughter of a friend who is in FFA (Future Farmers of America) who is experienced with livestock available to take care of the girls in the event my friend isn’t available. You may have a family member who can be trusted to do basic tasks that can’t wait for your return. Look for help. In a perfect world, I would have planted things like broccoli and brussels sprouts a couple of weeks ago. But, I was about to be gone for most of that two weeks, so I made the decision not to put in new plants or start seeds when I was about to be gone. Yes I sacrificed two weeks of growing time, but I knew I wasn’t going to be able to take care of them like they would need. Accept that you won’t produce as much as if you were home all the time. To everything there is a season. If you are in a phase of life when you are working a lot, or traveling a lot, it’s just a fact that your endeavors won’t be like they would be if you could devote all of your time to them. Your garden may not look like the photos in Mother Earth News and that’s just going to have to be okay. You do what you can, when you can. I assume you are gardening, or keeping chickens or bees, or whatever, because you enjoy it. It’s supposed to be fun. You probably live near a grocery store and you won’t starve if you don’t grow enough food. Remember, gardening is fun. Northaven Gardens is my favorite local garden store. Usually when I go there, I’m there for something specific. It isn’t very close to my house, so I’m there for a specific purpose. But, I can’t help wandering around and seeing everything. To guard against overbuying, I always start out not getting a cart. So far, every time I have ended up getting a cart. Do as I say here though, and not as I do. If all you have time and space for are 6 broccoli plants, don’t buy 20. 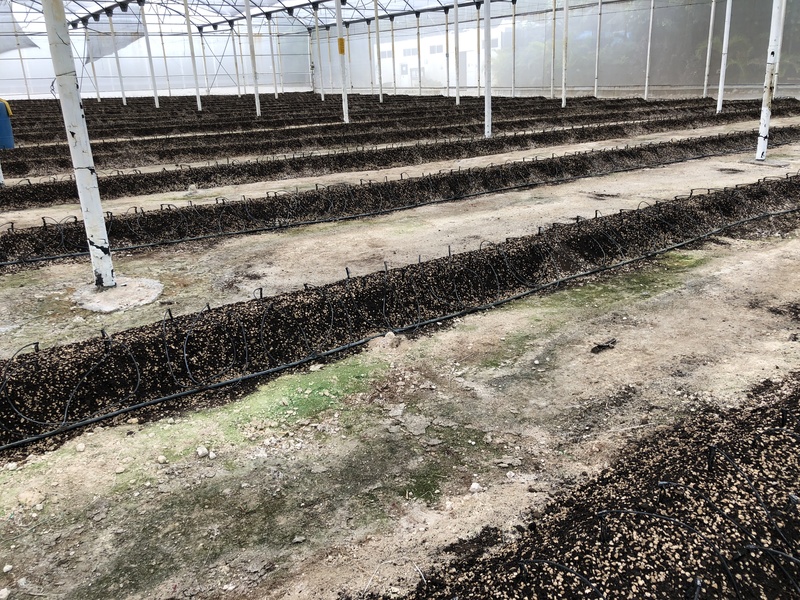 Remember you’re going to have to find time not only to get those plants in the ground, but also water, fertilize and harvest. There are things that grow well in your area. There are things that don’t. With lots of time and intervention, you may be able to coax other things into producing but if you are short on time, go with the sure things. Basically, you have finite resources. Just like in all other areas of life, success with gardening within a busy life is a matter of planning and intentionality. You can do it! We all know I love visiting gardens when I travel, and this one is near and dear to my heart. The greenhouse at El Dorado Royale is, I believe, the only place of its kind. I’m not aware of another hotel that grows so much of it’s own produce. If you know of one, please tell me in the comments because I will go visit! 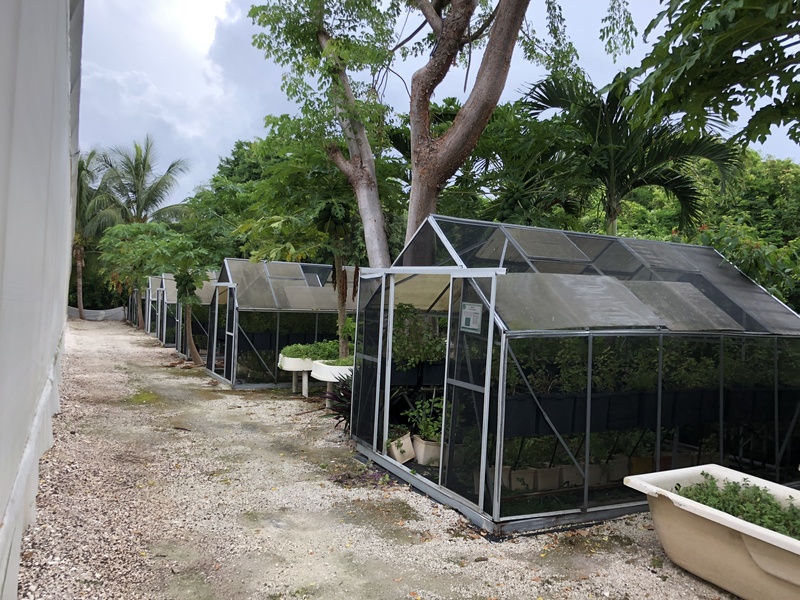 This 75,000 square foot greenhouse provides produce for all of the Karisma hotels in Riviera Maya, as well as providing produce for staff members to take home for personal use. 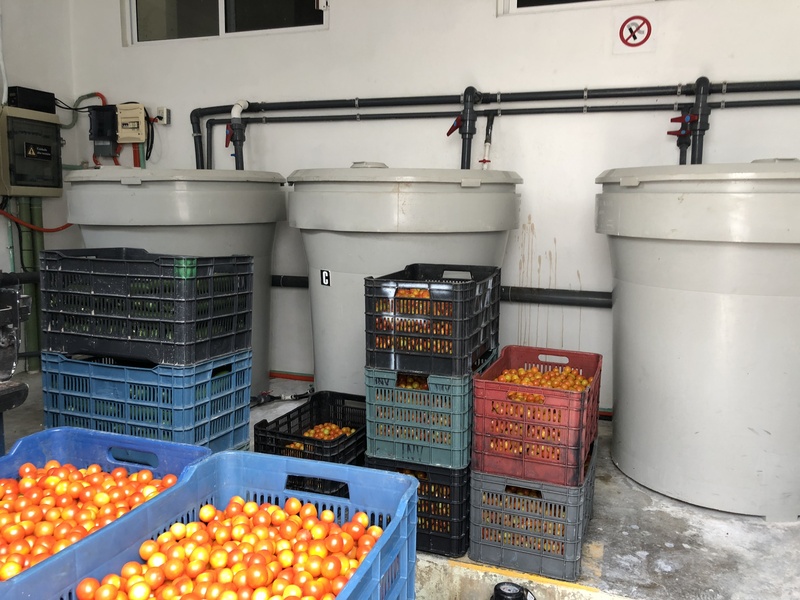 A fully outfitted processing center is onsite to prepare produce for use or for delivery to the other hotels. 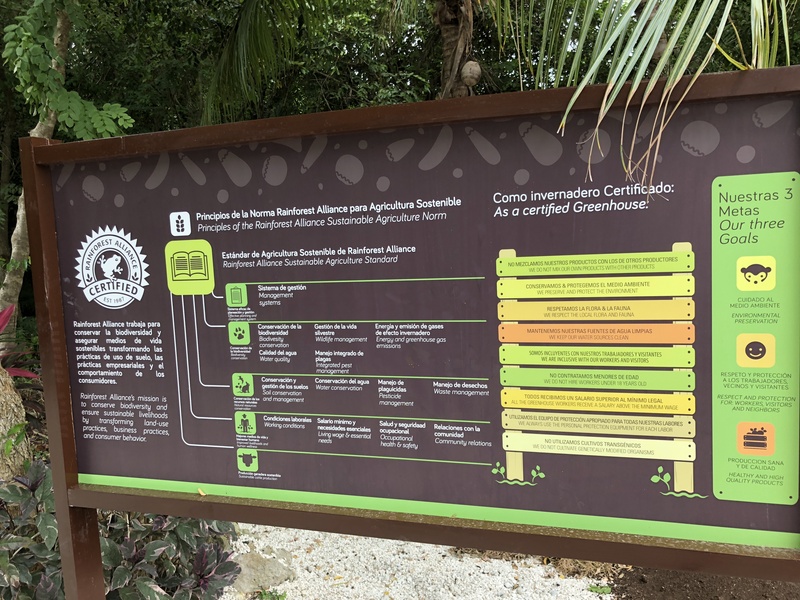 The Greenhouse at El Dorado Royale is Rainforest Alliance certified. This is a sign near the entrance outlining what that means and the standards to which they must adhere. We do not mix our own products with other products. We preserve and protect the environment. We respect the local flora and fauna. We keep our water sources clean. We are inclusive with our workers and visitors. We do not hire workers under 18 years old. All the greenhouse workers receive a salary above the minimum wage. We always use the personal protection equipment for each laborer. We do not cultivate genetically modified organisms. Those all sound like things we can get behind, right? 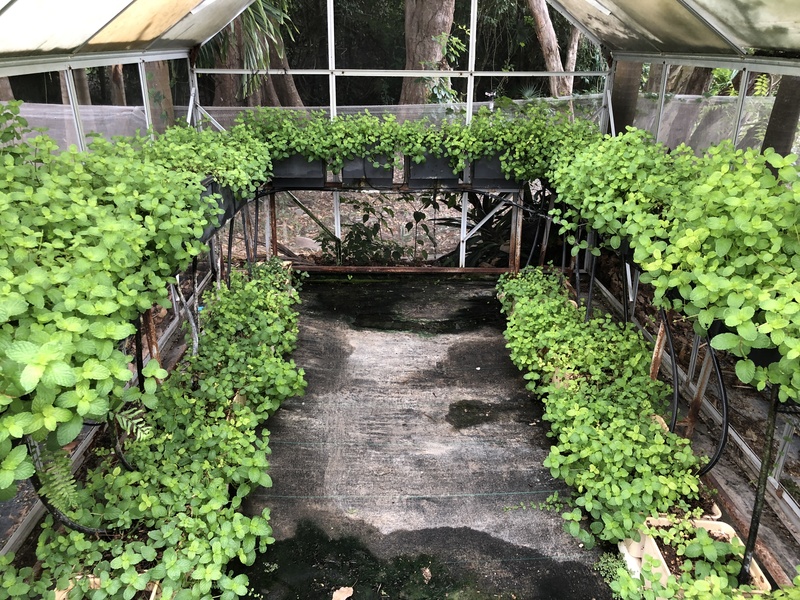 The greenhouse is operated with an extensive system of tanks, water lines and computers that regulate the amount of nutrients and water that flow to each plant. 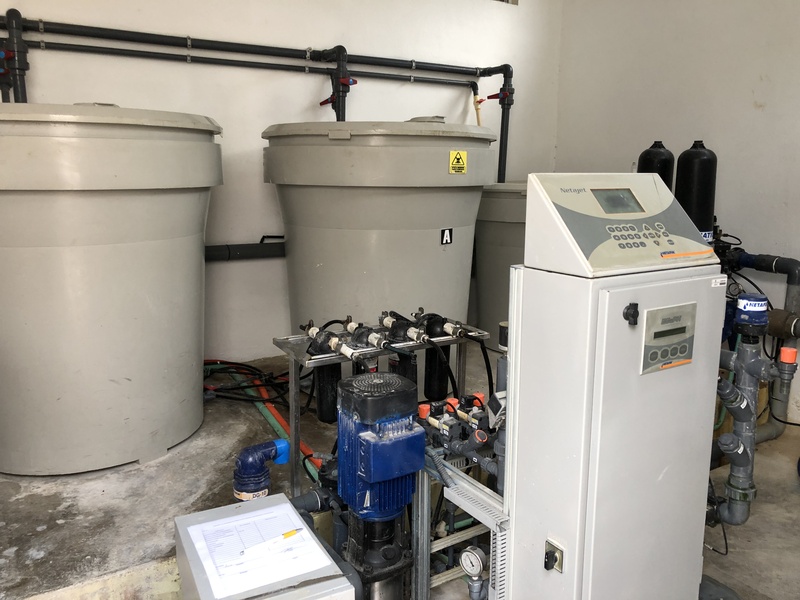 Here are the tanks in the control room that send the water and the nutrients to the plants in perfect proportion. The control panel that regulates everything. 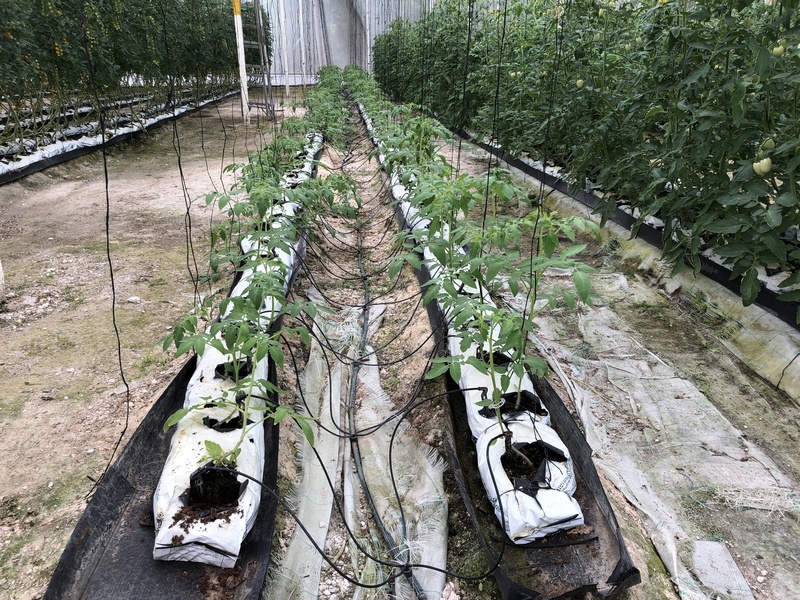 Here you can see the irrigation lines feeding to each individual plant. 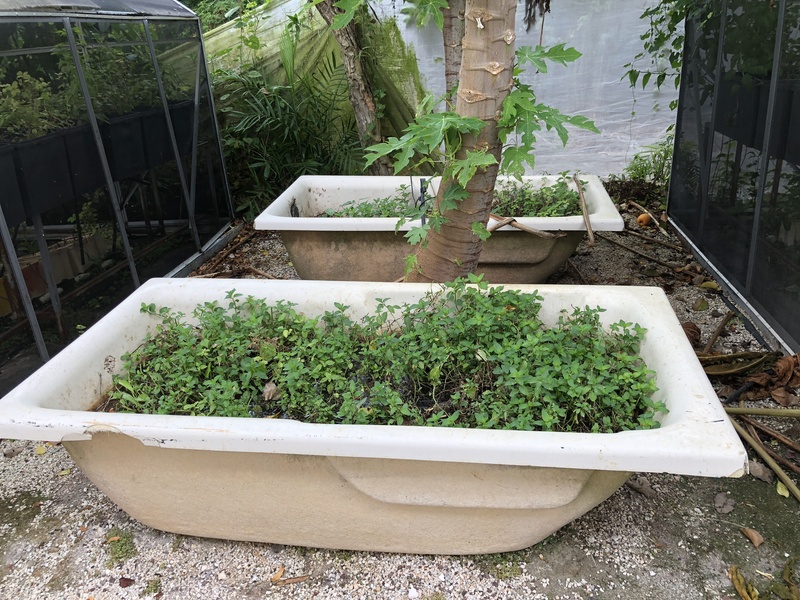 The growing medium they use is coconut coir. This is an infinitely renewable resource, especially in this part of the world. I use it for my worm boxes. It’s perfect in this application since all of the nutrients come from the irrigation. 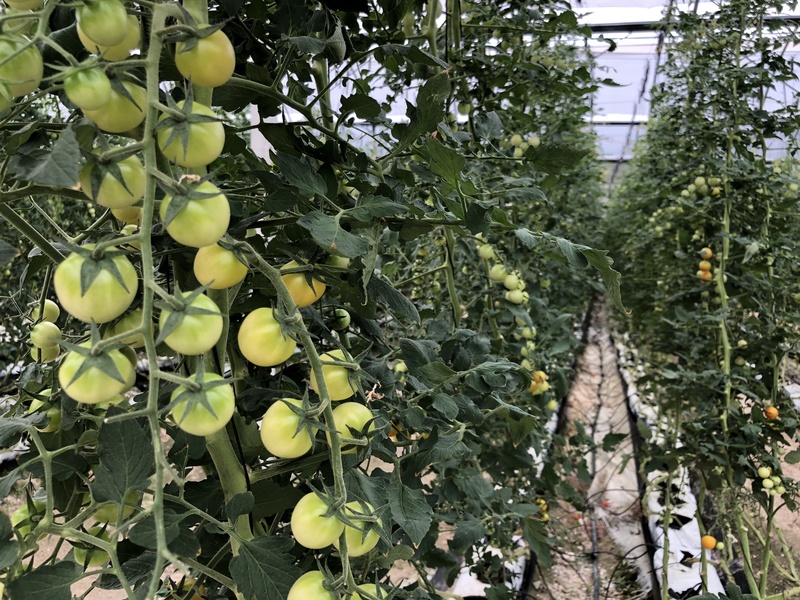 Workers are busy in the greenhouse every day harvesting, planting, working on keeping the greenhouse healthy and happy. 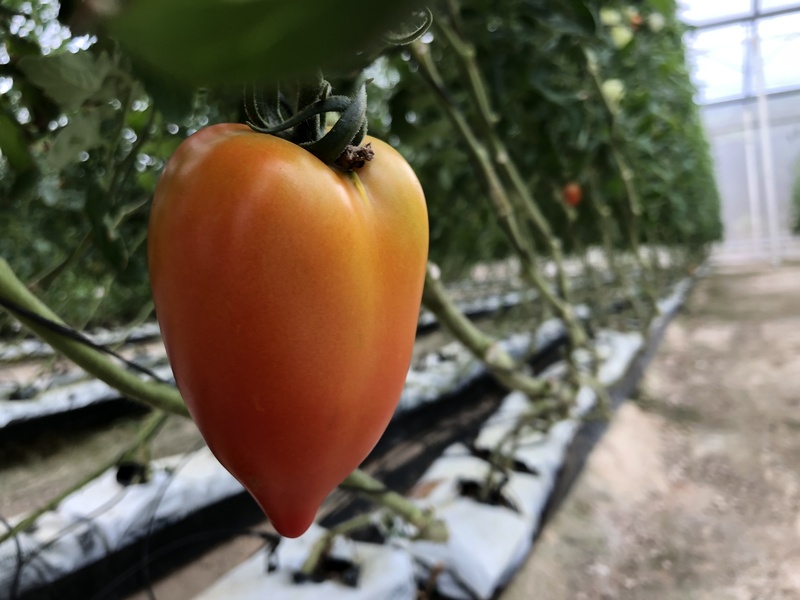 In the big greenhouses they grow primarily tomatoes and cucumbers. These Roma tomatoes are used primarily in sauces. 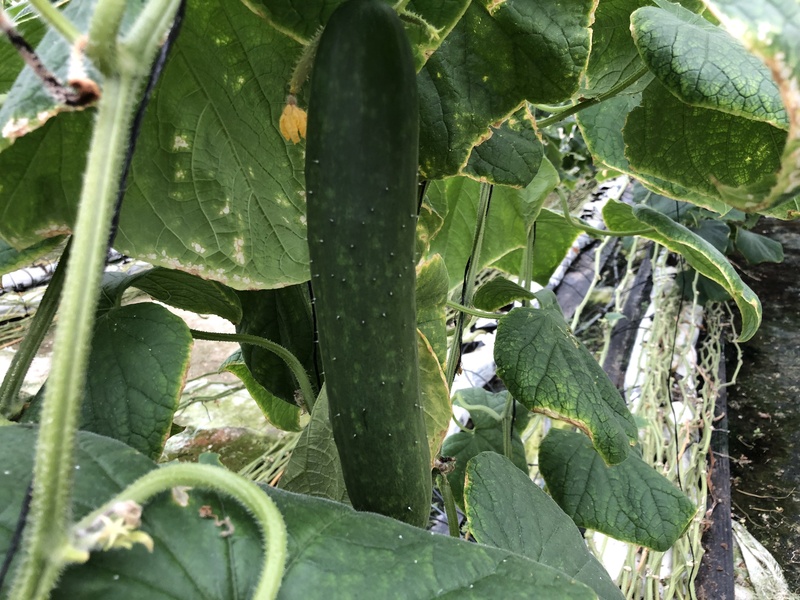 Growing cucumbers with no beetles spreading disease. Can you even imagine? A double door system is used to keep pests out. The greenhouses themselves are only part of the growing operation here. 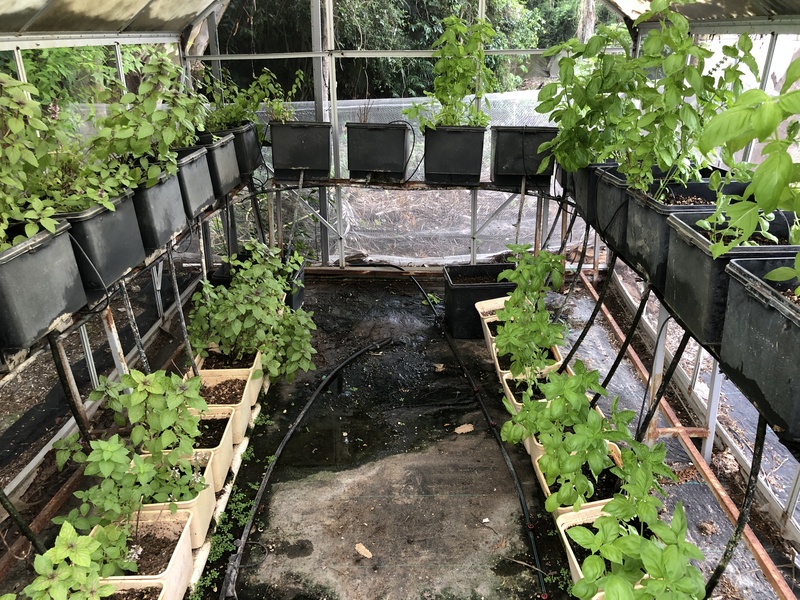 They also have smaller greenhouses where they grow mint, basil, cilantro and other things. Even abandoned bathtubs from a recent hotel renovation get into the act! 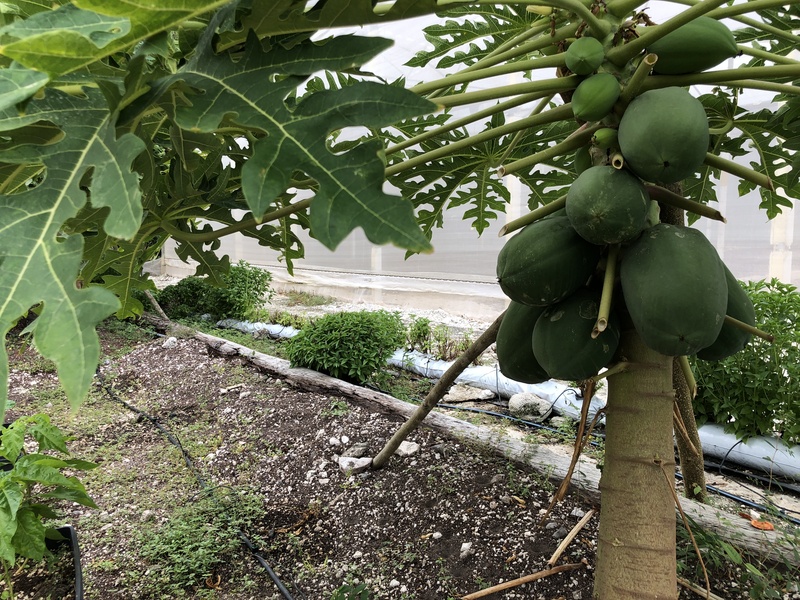 These papaya trees are only months old. Can you believe how big they are and how quickly they produce? I don’t even think I like papaya and I want to grow them! 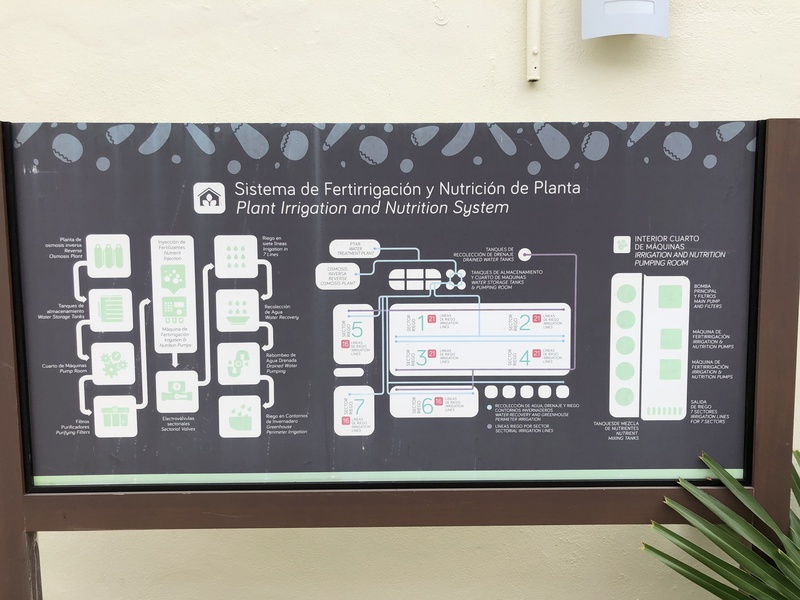 A diagram of the irrigation system. 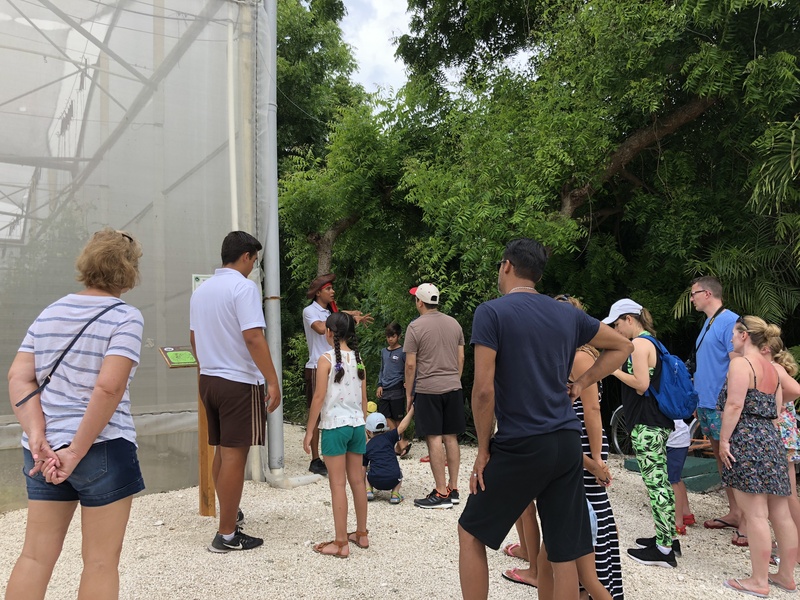 If you’re staying at El Dorado Royale, El Dorado Casitas Royale or Generations Riviera Maya, you can go on a tour of the greenhouse yourself! I love seeing different situations where food is produced. I love seeing people and organizations take advantage of their assets to produce food. This is a perfect example. The hotel has the land, they have the climate so they went for it! It’s been tremendously successful. The guests love it and it plays right into the other “green” aspects of the hotels. They also have solar hot water, and extensive recycling program and even a compost operation. On yesterday’s post, I explained that I got my hives “honey bound” by overfeeding them. My task since then has been to figure out how that happened. Here is what I have figured out. If you have some feedback, I’d love to hear it in the comments. I signed up for the monthly program at Texas Bee Supply where I get an email that tells me what I need to be doing in the bees each month. I read that I should be feeding them, and I am nothing if not diligent, so I was feeding them as much as they would take. From what I’ve been able to figure out, the advice they were giving was based on me having harvested honey in early July. Since I only got my hive in late May, I did not have any honey supers and did not harvest. So, my hive had every bit of the honey they had produced…and how I was feeding them unlimited syrup. It makes total sense that they went overboard and filled up all of the space which left our poor queen with nowhere to do her work. So, I guess the answer is to keep an eye on your frames. If the honey stores are low, pitch in. If they’re okay, let them bee! There’s No Brood In My Hive! So, yesterday was an exciting bee day for me and I must tell you about it. Today we are departing on our family vacation in beautiful Mexico. (Incidentally, dont’ believe anything that would lead you to believe that the resort areas of Mexico are anything but a wonderful and lovely.) But, back to the bees. Yesterday was filled with activities to prepare my various agricultural concerns for me to be gone for just over a week. This included adding syrup to my hive and installing a pollen patty. Whenever I open a box I can’t help but look at a few frames because I find the whole bee process so fascinating. I pulled out the first hive. LOTS of honey. No brood or eggs. Hmmmmm. Pulled the next frame. No brood or eggs. That’s strange. Next frame, the same thing. I went all the way through the top box. No brood. Lots of honey. I started through the bottom box. I got about halfway through when the thought finally sunk in. I have a problem. I may not have a queen. I’m leaving tomorrow. When I get back, this hive will be all but kaput. I immediately messaged the mom of one of my employees who is a more experienced beekeper than I am. She agreed that I have some kind of a problem and that if I didn’t want to lose the hive, that I needed to rectify it before leaving. I called Texas Bee Supply as soon as they opened to ask if they had any queens available. They didn’t, but they gave me the name of someone not too far from me who did have queens recently. I contacted him and explained my situation. He said he couldn’t sell me a queen by itself, but that he did have nucs or hives available. We discussed it and decided that the best course of action would be to go with a hive since I don’t have any extra woodenware laying around. He even decided that it would be better if he met me at my pasture since his bee yard isn’t that far from me and I drive a Honda CR-V so he would have had to prepare the hive to be inside an enclosed vehicle. At 3:30pm we met at my pasture, new queen and hive in tow. I asked him if, since he was there, if he would mind taking a look at my hive to give me his opinion about what was happening. He graciously agreed. We fired up the smoker and opened up the hive. Believe it or not, he found the queen! It looks like what happened is that my hive was what they call “Honey Bound”. It’s when the bees use much of the available space to store honey and the poor queen isn’t left any room in which to lay her eggs. So, she was hanging around with no where to do her job. In order to remedy the problem, here’s what we did. Let’s call my original two box hive, “Hive A”. We took the top box off of Hive A and put it on top of the newly purchase “Hive B”. We put a sheet of newspaper between the two hives with slits, which is supposed to help the two populations of bees have a more gentle introduction to each other. Then, I took the only woodenware I could quickly get my hands on (a shallow 10 frame honey super) and put it on type of the original Hive A. With any luck, the workers in Hive A will build out the frames in the new honey super which would give that queen space to lay some eggs. I’m not supposed to check on them for a least a week, which is handy since I’m not going to be in the country anyway. When I get back, I’m supposed to get ahold of two deep boxes. I’ll put one deep box between the top and bottom box of each hive. This will give each hive room to grow. We also dumped out the whole 2.5 gallon feeder of syrup so that the bees would have to eat some of what they have stored in the hives. So, time will tell. Will the queen in Hive A start laying again? How will the bees in the new Hive B get along? Stay tuned. When I got my chickens a couple of months ago, I started spending lots of time out in the pasture. They’re so much fun to watch, and since they’re my first chickens I like to watch them and see how they act. As those first couple of weeks came and went I was driven crazy by bites all over my feet and around my waist along with some other sensitive areas we won’t talk about here. I decided to try to figure out what was eating me alive. Because of the pattern of the bites, I identifed the bites as chiggers. Then, I found this article that talks about how this is the worst year for chiggers in thirty years. How chiggers work is that they get onto your exposed skin usually from high grass. From there, they crawl into a tight space (like into your shoes or in your crotch or waistband) and from there they insert their little mouth like apparatus into your skin and inject enzymes that dissolve the cell walls of your skin, and that’s what they eat. They don’t burrow inside you and they don’t drink your blood. Now, I’m not an entymologist, and I don’t play one on TV and I’m sure there are many more detailed explanations you can find, but that’s the main gist of it. So now, when I go to the pasture, I put on my chicken boots. I keep them in the car and put them on 100% of the time before I get out of my car. 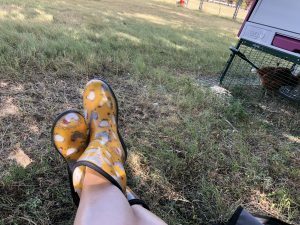 I haven’t had a single chigger bite since I started wearing my chicken boots while at the pasture. I highly recommend getting your own pair of chicken boots (or whatever other style you want).